Let me guess: You sleep with your iPad, don’t you? 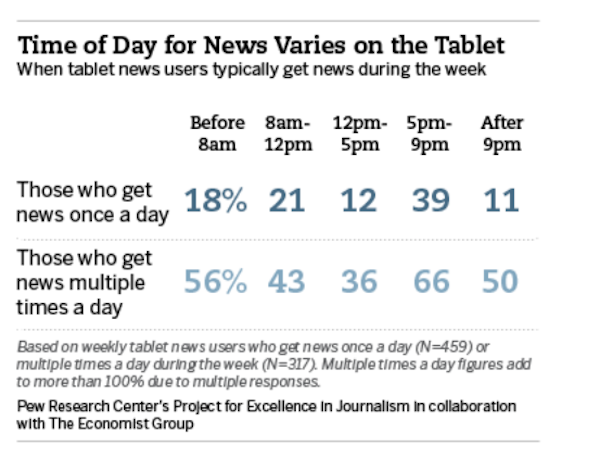 A new Pew study finds that most news junkies turn to tablets late at night and early in the morning. Oct. 1, 2012, 12:01 a.m.
By Adrienne LaFrance @adriennelaf Oct. 1, 2012, 12:01 a.m. Chances are good that the warm glowing warming glow of an iPad screen is one of the last things you see before you fall asleep or one of the first things you reach for when you wake up. A study released today by the Pew Research Center’s Project for Excellence in Journalism finds most news junkies who own tablets use them before 8 a.m. and in the after-work hours. The explosive growth in mobile devices isn’t just changing where we access the news — waiting in line for coffee, sitting on the train, walking down the street — but how much news we consume and when we get it. People who get news on their devices multiple times per day, on either the smartphone or tablet, tend to turn to more sources, get news from new sources, read in-depth news articles, watch news videos, and send and receive news through email or social networks. Tablet news consumers who get news more than one time during the day are also twice as likely as those who get news once a day to have paid for news on their tablet. Most tablet users reported using the device daily for an average of almost two hours. Just over a third of tablet owners reported using the device for news on a daily basis, with news consumption as the second-most popular daily activity on the device, after checking email. While news remains popular on tablets and smartphones, the widening markets for the devices has driven down news consumption habits slightly. Similarly, fewer people, as a percentage, reported paying for the news on mobile devices in 2012 compared with last year. Pew chalks that up to the broadening population of tablet owners — and not necessarily a decline in willingness to buy the news. Tablets are designed to be portable, but Pew found most people — 85 percent — are still using them mostly from home. Pew’s findings also reinforce the idea that tablets are an after-work “lean back” experience for most users. Evening remains the most popular time of day for people to turn to their tablets. The preferred times for checking news on smartphones were more varied. About a quarter of smartphone users check the news first thing in the morning, and 30 percent do so before noon. Only about 18 percent of smartphone users turned to their phones for news in the evening, and even fewer — just 7 percent — late at night. So where does the old-school portable news product — print — fit into the mix? Not all of the most plugged-in news consumers have abandoned the medium. A subset of news consumers with multiple devices remain loyal print subscribers. Most people opt for some bundle of digital and print habits, with a quarter of those surveyed saying they’re considering switching out the print component for digital-only. Consumers who use tablets, smartphones, laptops, and print reported spending the most time getting news on a tablet — 77 minutes — and the least time getting news on a smartphone — 51 minutes. But print only got five minutes more attention than smartphones, with these cross-platform news consumers reporting spending about 56 minutes per day with print news. If the physical print publication is not stacking up on the nightstand or coffee table — but rather is filling up out of sight inside the digital device, will people ever read back copies? And if not, does that reduce the value of a publication for them? The findings show that even for this expanding population of tablet owners, 28% read back issues, down somewhat from 38% in 2011. POSTED Oct. 1, 2012, 12:01 a.m.
LaFrance, Adrienne. "Let me guess: You sleep with your iPad, don’t you?." Nieman Journalism Lab. Nieman Foundation for Journalism at Harvard, 1 Oct. 2012. Web. 19 Apr. 2019. LaFrance, Adrienne. "Let me guess: You sleep with your iPad, don’t you?." Nieman Journalism Lab. Last modified October 1, 2012. Accessed April 19, 2019. https://www.niemanlab.org/2012/10/let-me-guess-you-sleep-with-your-ipad-dont-you/. | title = Let me guess: You sleep with your iPad, don’t you?